This beautiful Queen Anne-style home was built in 1900 for Edward and Annie Roessler, who lived in the home until 1907. Jones and Hoyt of Redlands were the builders. They were involved with the construction of a number of other homes in the same neighborhood. The Victorian cottage sits on the northwest comer of Olive Avenueand Grant Street, in the Smiley Park Neighborhood Historic and Scenic District. It is just a block from the Redlands Bowl. The home is single story and has seven rooms. A predominant feature is the wonderful wrap-around porch at the comer. The wide front steps and the porch are concrete, and there are five round columns set on concrete piers supporting the roof. The low banister has sturdy turned balusters. There are two entrance doors off of the porch. The home has a very attractive flowing bell-form, multi-level, hipped roof, which is capped by two brick chimneys and a vented roof ridge on the highest peak. Both cross- and hipped-gables with louvers serve to ventilate the attic. The exterior of the home is clapboard. Adjacent to the front porch is a bay window at the parlor with inset painted panels below it. The top of the window is patterned leaded glass. Two other windows facing Grant Streethave the same leaded glass at the top. A window in the dining room is stained glass which was installed in the 1980s. The home has its original brick foundation, and several of the crawl-space vents have attractive cut-out cover panels. The original owner of the home, Edward E. Roessler, was a prominent photographer in Redlands. 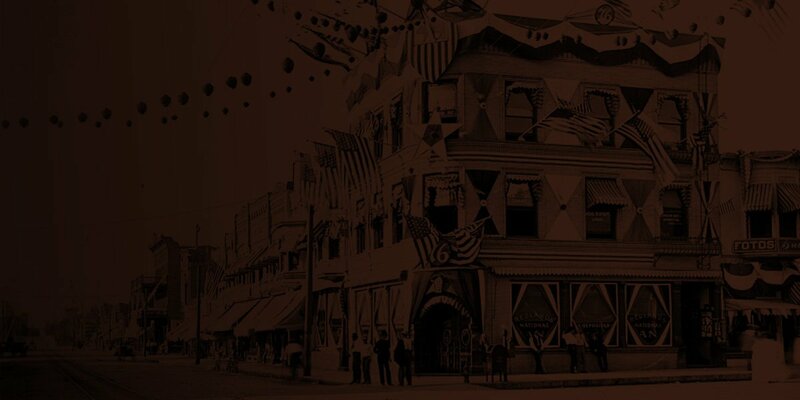 His office was located in the Union Bank Building at the corner of Orange and East State Streets. 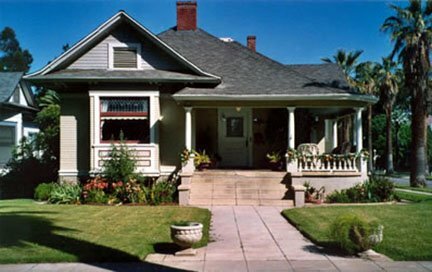 Some of his photographs ofWest Olive Avenue and other neighborhoods were used in advertising to market the attraction of living inRedlands. Other occupants of the home were the George and Kate Pool family from 1907 until 1947; the Walter Ruddick family from 1947 until 1962; and Charles and Bebo Stultz from 1962 until 1977. Charles Stultz served 16 years on the Redlands School Board, seven as president. The home was in four other ownerships between 1977 and 1994, when the current owners bought the home. The Redlands Area Historical Society is very pleased to recognize Rosa Gomez and David Van Diest for the great care and attention they have given to their home, and to present them with a 2004 Heritage Home Award. Researched and written by Ernie Dierking.